SINGAPORE (Reuters) - The Philippines told countries outside Southeast Asia on Monday not to use the region as "a proxy for their rivalry" as it wanted to preserve unity and establish a mechanism to resolve disputes in the South China Sea. The Philippines is chairman of the 10-member Association of South East Asian Nations (ASEAN) this year and will host its annual meetings, some of which are joined by outside powers including China and the United States. The issue of territorial disputes in the South China Sea pitting China against several Southeast Asian countries has in recent years emerged as a source of friction in the bloc. Some ASEAN countries have taken positions on the issue in line with China, while others have been more suspicious of China's assertiveness, reflecting U.S. thinking. 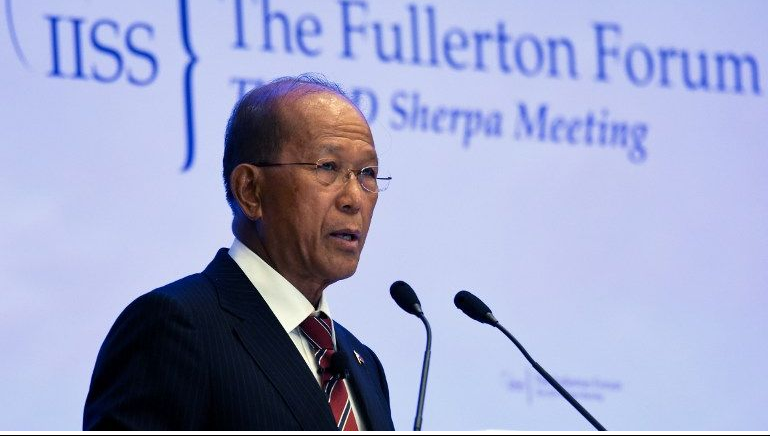 Philippine defense minister Delfin Lorenzana told delegates from more than 20 countries at a security conference in Singapore that outside powers should not pursue their competition in the region. "As the host to the leaders of the U.S., China, Japan, Russia and India, we will have to remind our friends, firmly if necessary, not to use ASEAN as a proxy for their rivalry," Lorenzana said. "We will reaffirm the unity and solidarity of ASEAN amidst this emerging super-power competition." ASEAN is drawing up a code of conduct in the hope of making sure all claimants follow legal and diplomatic processes in settling territorial disputes. Lorenzana said he hoped the code would provide the framework for lasting solutions to the disputes over the waters. About $5 trillion worth of goods passes through the South China Sea every year. "We want a rules-based, lasting solution to this issue," he said. China has built several artificial islands in the exclusive economic zone of the Philippines, which an arbitration tribunal last year ruled unlawful. With billions of dollars of potential Chinese trade and investment at stake, the Philippines has a difficult balancing act in upholding its sovereignty claims while staying on the better terms President Rodrigo Duterte has established with historic rival China. On Monday, China agreed to cooperate with the Philippines on 30 projects worth $3.7 billion focusing on poverty reduction, the two countries said after a meeting in Beijing. Vietnam, Malaysia, Brunei and Taiwan also have claims in the waters.